Sizing: is bigger always better? How do you tell if a student is matched with the appropriate bass for his or her size? There are many popular methods to judge bass sizing and height; I would point out that many popular string methods books have pictures of bassists with the nut at eye level, or encourage the bassist to stand with the hand on the neck block with the arm extended out to see if the hand is level with the shoulder. I say that while these are fine, there are more precise methods to determine proper sizing. In his book, Jeff Bradetich encourages teachers to look at whether both hands can reach playing position comfortably. Looking at the bow arm and left hand in first position, and other positions, can really help you see if you're on the right track. Similarly, Johnny Hamil likes to see the students with both hands touching the bridge, and with the arms in the "fly away" position. But what if I don't have a bass for my student to try in person, or what if I need something more accurate? I had a conversation a few years ago with a colleague and friend, Gene Rebeck. He is a Suzuki teacher and rents out several basses from Michigan, and I had a student who needed a very small bass before those became available in Texas. I wasn't quite sure how small we needed to go for a 6 year old student, and he asked me to send him a photocopy or a tracing of my student's hand. This was a PIVOTAL moment for me, because I realized that no one had ever looked at my hands (which are quite small compared to many of my teachers') to see if they matched my bass. So simple! After this conversation, I began measuring my students' hands against the size of the whole step at the neck block (which is where I start a student for Shortnin Bread and Scotland's Burning). I noticed some discrepancies in sizes among makers, and wanted to collect this data somewhere useful. It is incomplete, but I hope to share more over time. I also plan to eventually start collecting data about bows for these sizes, but I'm not quite prepared to go there yet. Below is the data I have compiled from a few sources willing to share information no these sizes. Many of them are basses that are owned by my school district, hence the source "HEB bass". 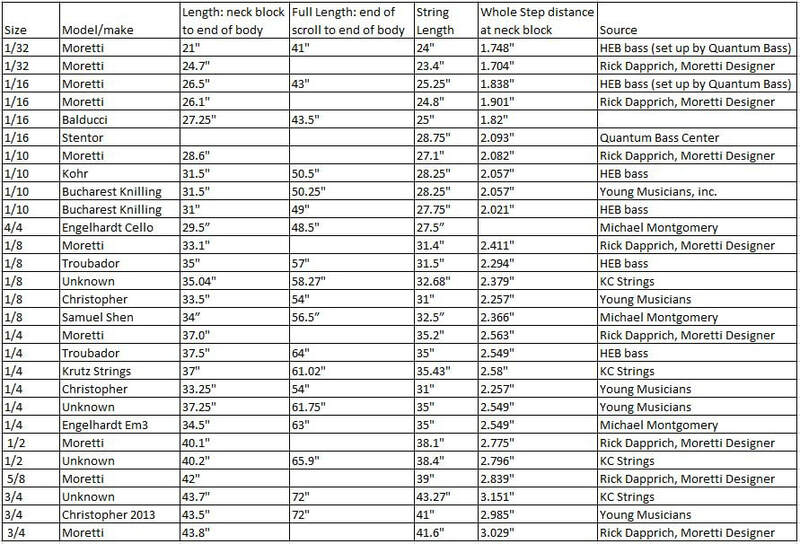 If you are interested in sizing according to the base knuckle theory, or would like to know the process, Mitch Moehring suggested I use the Stew Mac guitar fret calculator to find the below measurement titled "whole step distance at neck block" (Francois 3rd position, Simandl 4th position; electric bass frets 7 to 9). This is important to teachers of beginners especially because that's where we start in the hopes of building a beautiful left hand setup with a nice, relaxed hand frame. If a student has to stretch his or her fingers at all in this position, imagine what will happen once you explore first position, where the notes are even farther apart! Things to consider: when I measured my own hand, I would size myself at approximately a 39" string length. This is interesting to me because I always struggled with tension in my playing until I started playing on my French bass restored by Arnold Schnitzer. Although the string length is longer than this, I felt an immediate change in my playing due to the vastly smaller shoulders than the Prescott bass I was playing, in addition to a lower tension string. In conclusion: be passionate and protective when it comes to the size and setup of the bass you play, as well as your students. If it's not available, pester your local bass shops or write a grant to get the appropriate instruments. The more we fight for the instruments to fit our students, the more our students will achieve. Please send me measurements if you have an instrument that will add to the database. The more information we share about sizing, the better!